An attachment is a file (document or program) attached to an email. In many email applications (e.g. Windows mail ) a picture of a paper clip indicates the presence of an attachment. Attachments are used to send supporting files, photos etc that is supplemental to the email. All attachments should be treated as unsafe, and not be opened unless you are sure that they are virus free. You should always save an attachment to your hard drive, and scan with a virus checker before opening it. Note: Gmail and Yahoo automatically scan attachments for viruses before placing them in your inbox. Email providers and email clients may block certain attachments. Executable files like .exe, .bat, .cmd etc are usually blocked. If you need to send these types of files you can rename them or zip them or use a file transfer service. You may also find that encrypted attachments are also blocked as the provider cannot virus scan encrypted files. If you use Gmail,Yahoo Mail,outlook.com with a web browser client (webmail) or a mobile phone email App then downloaded attachments are normally placed in a folder called downloads in your user profile. Note: You should always download and virus check an attachment before opening it. If you are using an email client line Windows Live Mail then attachments are downloaded, and stored with the email message. 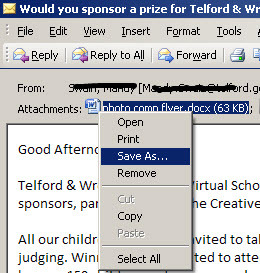 For desktop clients like Outlook you can save the attachment to your file system by right clicking on the attachment icon and selecting save as. Note: Saving an attachment does remove it from the email and that the attachment is still stored with the email. To print an attachment you will need to open it. This usually involves saving it to your computer first. The attachment will be opened using a compatible program e.g. pdf attachments are opened with Adobe Reader. Note: you may need to install a supporting application to read and print some attachments. If you forward an email message most email client will,by default, forward any attachments with the email. If you don’t want to forward the attachments you will need to remove them before sending the message. Most email clients allow this. 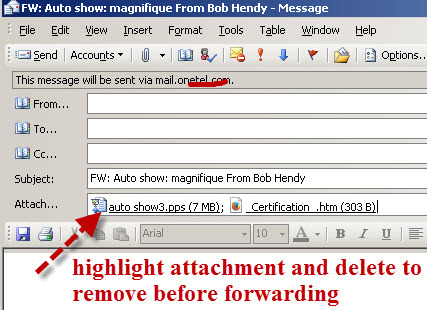 Outlook (2003) shows the attachments on a separate line, and so all you need to do is highlight the ones you don’t want to forward, and hit delete. Most email clients use the paper clip icon for adding email attachments. Just click the icon and you should get a browse window that lets you locate the file or files that you want to attach. Remember that some attachment types may be blocked so be careful what you attach. Blocked attachments and large attachments can be sent using a file sharing service like OneDrive, Dropbox or Google Drive. Email providers have attachment size limits, and even though they are constantly increasing they are not uniform across the Internet. This means that your provider may allow the attachment, but it may be blocked at any other email server on its way to its destination. Fortunately there are now many solutions for sending large files, which are just as easy as sending them by email. Most systems involve you transferring your files onto a website (which the provider provides), and then anyone who wants to receive the files can download them from the website. To send the files you usually select which files your would like to send, and the email addresses of your desired recipients. The recipients receive an email with a download link, clicking the link starts the download process. By using these mechanisms you will never need to worry again about emails being rejected because attachments were too large or because they are encrypted, or blocked! Here is a quick diagram that illustrates the process.. If you need to send confidential attachments like tax returns etc then you can easily protect them by using file encryption software to encrypt them before sending. The easiest one is the free open source 7ZIP tool which is a file compression tool that also supports encryption. Q-How many attachments can I send? A- As many as you want. It is the total attachments size that is limited. Q- Can I encrypt attachments? Q- Can I send email attachments using Dropbox even though the recipient doesn’t have a Dropbox account? A- Yes you can. 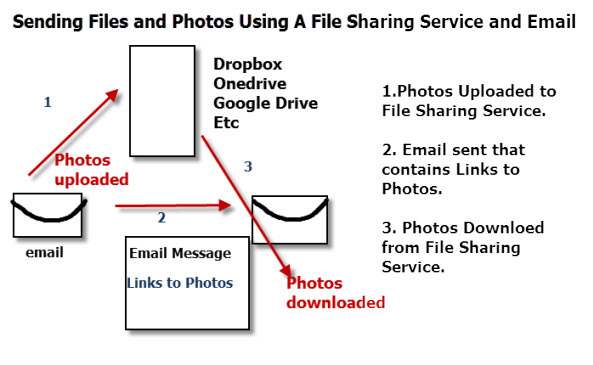 However the recipient needs to download the attachment from Dropbox as the link to the attachment might expire. Q– Can I send a folder as an email Attachment? Email Attachments let you send and receive files and photos using email. You should treat all attachments as potentially dangerous and always virus scan them before opening.